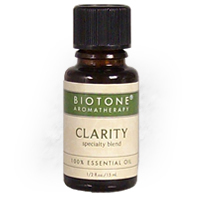 Biotone Clarity Essential Oil Blend is 100% Pure. Blend of Lemon, Rosemary, Lemongrass and Peppermint essential oils. Opening and centering. Join our mailing list to receive the latest offers, updates & promotions!